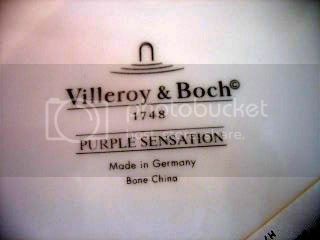 I am fortunate enough to have a little Villeroy and Boch Store in town. I am not fortunate enough to afford to shop upstairs, so I head straight for the bargain basement and wait for the sale! The flowers on the plate are purple and pink..so my flowers are Baby's Breath with purple and pink dianthis.. The Pink water glass is from Lenox, and the Purple wine is from TJ Maxx. 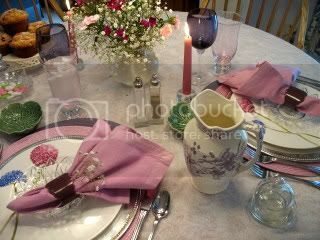 The pink napkin with a sprig of Baby's breath is held by another Villeroy and Boch basement bargain, it is purple porcelain. There is a green stem so I used the little cabbage leaf bowls sent to me by my friend Susan from Savoring Time in the Kitchen. Perfect for a dinner roll and butter from the little butter dish from WmSonoma.. The purple "toiley" pitcher is a gift from my friend Barbara. The silver chargers are from WMSonoma Outlet.. I got them the time I met Doug Wilson from Trading Spaces fame on TLC...It was a dreary winter day and only about 3 people in the store! He was standing right next to me, so we chatted a bit, and you will be so proud..I didn't ask him for an autograph. I have been told he has a house near here, as I saw him again in the Pier One near me...Big deal, I know..:) I am easily amused..
DH made fresh blueberry apple muffins this morning..it sure makes the kitchen smell heavenly while they are baking..
*******Summer arrives June 21st...get out your summer whites! So many of us have WHITE dishes, I was wondering if you would be interested in a WHITE event..white tablesettings, flowers and foods.. Hey, vanilla ice cream is white, and lots of other things too...anything having to do with food or tables to show us your whites. Carol, no, your whitening toothpaste won't do! That is a very beautiful table!! love the green bowls. I also adore the red one you have as your header. I really like the purple sensations - alliums are one of my favorite flowers - I have the seed heads drying in wine bottles as my patio centerpiece these days. 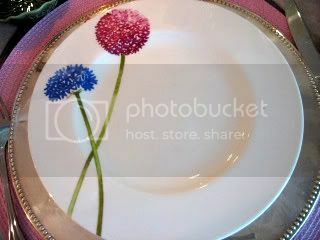 Kathleen, I heart alliums :-) I think those plates are wonderful! You must be so organized with all your different tablesettings. I know it is a fun hobby for you, and I look forward to having the time some day. My husband would not know Doug Wilson either. 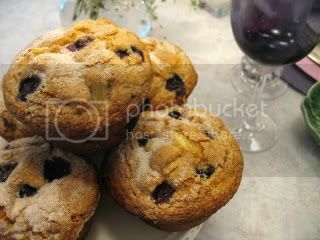 I love that your husband made muffins for you. So sweet. Now the white table idea sounds like fun and I could go to my daughters house and play with her white PB dishes. I like your dishes today and your header too. I have one set of dishes so I can't play along but I enjoy viewing. Thanks for sharing. 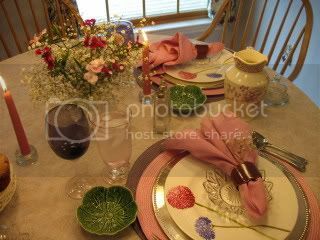 Kathleen, Your table setting is beautiful! Sounds like you like good deals, too! 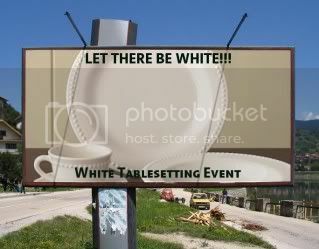 I would love to join in on a white event! I will keep checking back so as not to miss it! Sounds like fun. Hugs ~cindy s~ PS I am putting you on my list of favorites! Love your new dishes and setting ! Those colors scream summer ! Love the lenox too ! Thanks for stopping by...wow...what a fortunate thing for you to have that "Lobstah" catcher in your group of parents...what feasts! Lobster salad on Portuguese rolls...YUMMIE! I love Vileroy & Boch dishes and these are beautiful...great combination...so pretty! Pretty table -- love the plates. Hi Kathleen! Your table is beautiful! I'd love to participate in the white dish event. Sounds like fun! Hi Kathleen! Oh, I love your table. Those dishes are beautiful and how fortunate to be so close to the outlet! I'd break Mr. Precious I'm afraid if I lived close to a wonderful place like that! 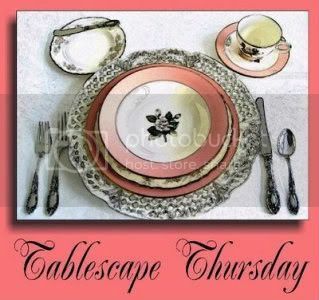 I'll be there for the white tablesetting event! I'm out hunting for really white dishes so I am happy to join in! I'm in agreement with others - love the plates!!! Also the "toiley" pitcher. I may surprise you with the all white tablescape idea! I have white dishes from Walmart and the Gibson ones...I'll have to check on what else I may have! Great idea!! What fun -a white event! I'm in. Love the puroke wine glassess--I always stop at the V & B store near you whenever I am in town! 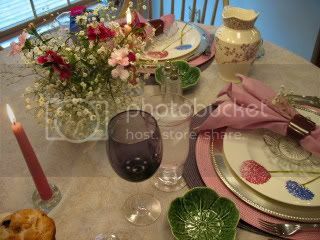 TJ Maxx and WS always have the best little odds and ends that can make a table look great! Yours looks fabulous! Have a great day! I love the plates! Great deal. And I love your "toily" pitcher. I would be all "giddy" to see Doug Wilson too. And my hubby wouldn't have a clue who he was either. Thanks for visiting my tablescape & leaving me a comment. * EVERYTHING looks so lovely & charming, but that PITCHER!! !~~~ "Oooooh la la"! Sooooooo PRETTY!!! The glass dishes in your header setting are scrumptuous, too! 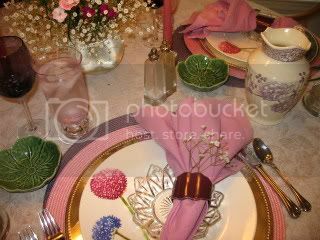 Kathleen ... Love Purple Sensations and your entire tablescape. Such great buys ... It seems like you enjoy the hunt as much as the find. 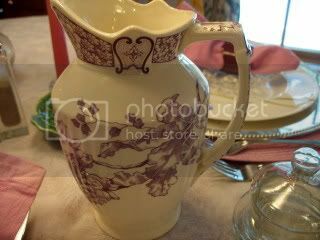 The toile pitcher is pretty, perfect for your table. LOVE that plate with 2 flowers! I love the idea of an all white tablescape event. I will be here on the 21st! Can't wait! What a beautiful table. Enjoyed reading your blog today. I am still finding my way around blogland....I always love making new friends..I am posting about Disney so hope you will stop by. Commenting automatically puts you in the drawing for the June giveaway. I'm in with the whites! and you can bet I'll find some way to work in the toothpaste, LOL! I love those dishes! Purple SENSATIONAL! You found Doug twice, what about our friend, YUMMO? No sightings yet? Love this Sensational Summer Setting...Especially eyeing that 'toily' pitcher. The White Event sounds like a fun challange for all. Great idea. I'm sorry I'm late chiming in! I visited the other day and must have gotten distracted by something and THOUGHT I had left a comment! Count me in for the white event - more summer fun! Forgive me for being so late looking at your blog posts. You know I've been handicapped! Those are very unique plates..alliums. I love them. And that purple toiley pitcher..pleause put that in my hope chest :-) I have to put my thinking cap on for the White event...but I'm there. Oh your purple sensations dishes are absolutely gorgeous. Such a beautiful tablescape. I love the way you mix things and always highlight your colors so perfectly. I think the white table sounds like a super idea. Let me know the exact date and I will play too. It should be a lot of fun. Also, be sure to join the Cloche Party (other containers also accepted) on June 19th. Hugs Marty. I had fun taking part in my first white tablescape party! Thanks. All of your white photographs are just lovely.